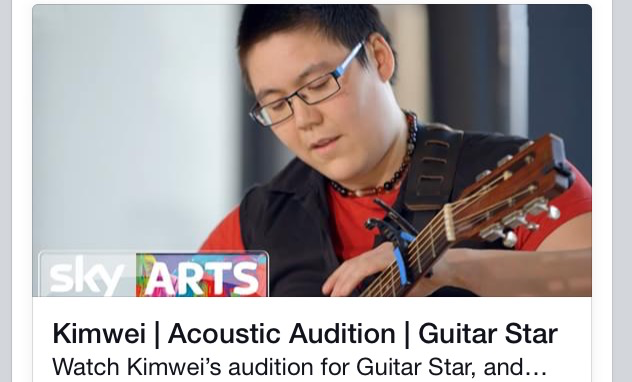 On June 9th 2015 I performed in Episode 1 of Guitar Star, Sky Arts’ new music show and guitar competition ( https://m.youtube.com/watch?v=tm1_CijCfYs ). I know what you’re thinking, but I wouldn’t have entered at all unless I was totally convinced that this show is nothing like X-factor. It’s about celebrating the guitar and musicians. Truly. Even though I make music videos all the time, it was strange to see myself on film. It was lovely to know I’d been picked to audition out of 1000 applicants, and to meet such a diverse set of musicians. But the strangest thing for me was the ‘competition’ aspect of the show. I never really see music or art in that way so the concept of a music competition seemed like a contradiction in terms. How can anybody be in the right mindset to create something beautiful whilst thinking to themselves ‘I wonder if I’m going to win’? I do think that this TV show will be very positive for the guitar and how guitarists are viewed. The audition for me was simply day out, performing to an incredibly receptive crowd. I’d have happily played them a full set! It was also wonderfully affirming to get encouraging feedback from Nitin Sawney, Huey Morgan and Helen Sanderson – that in itself is an experience you can’t buy. This time last year I was running out of money… on purpose. I’d set myself the challenge to face my money fears by quitting work and vowing to seek no more income until my bank balance reached zero. A year after running my bank balance to zero, as you can see I’ve worked my way back up to riches! To make it even harder, I was to make my way back up from zero without begging, borrowing or stealing – so no overdraft, no benefits or handouts. I wanted to address fears that self-employed people often have about running out of money with no work booked. I’d always feared this but it had never actually happened to me. Although I found the experience wholly positive, I’m not implying that poor people aren’t suffering, just because I was poor for a week. Many people, even in the UK struggle to feed themselves and this is not ok. “Using less money” and “being poor” are not the same thing, as shown by Moneyless Communities. The challenge taught me that money is not my only resource: Because money can be exchanged for any goods, it easy to see it as life-blood. But there’s also trade (in goods or favours), dumpster diving, making things and more. Although I did run out of cash, I started to earn money again before my food ran out. A year later, I’m back to earning a living, but my lifestyle is totally different – it’s much MUCH freer, financially, in terms of free time and abundance. Through adopting a minimalist lifestyle, I’ve cut out my consumerist habits (which I never thought I had!!!) so I can spend what I do have on the things that really matter. I’m more resourceful than ever before and despite having a relatively low income, enjoy more luxuries. This summer, through a mix of work and favour exchanging I’m taking two trips to Europe. Last month, in the same way I enjoyed a beautiful trip to Wales and an all expenses paid visit to London including food and hotels.